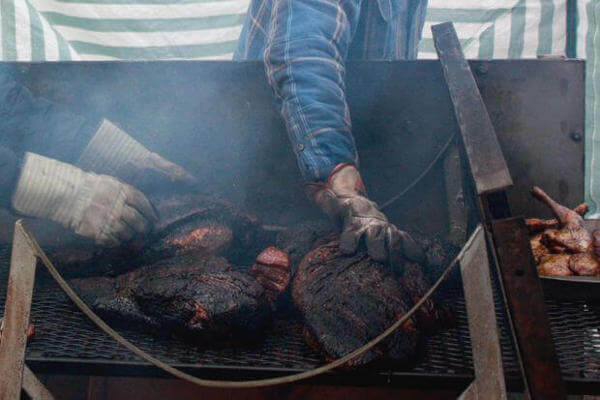 Smoking that first brisket can be intimidating, but with these smoked brisket recipes and tips you should have little trouble. And if you can pull tender, juicy briskets from your smoker every time, you just might find something here that will add to your skills. Because beef brisket contains a lot of tough connective tissue, it requires extended cooking to become tender . Braising in liquid and baking are the typical cooking methods and both do a good job of breaking down the collagen tissues. But when smoke is added to the equation, things change. Smoking low-and-slow creates additional layers of flavor, including the well-seasoned, concentrated flavor of the chewy bark and the subtle taste and texture differences of the smoke ring. The sliced brisket shown below was smoked for my niece's wedding reception dinner. We didn't have enough smoker capacity for cooking four briskets, so my brother and I put together an open pit smoker using some odds and ends that were laying around his shop. 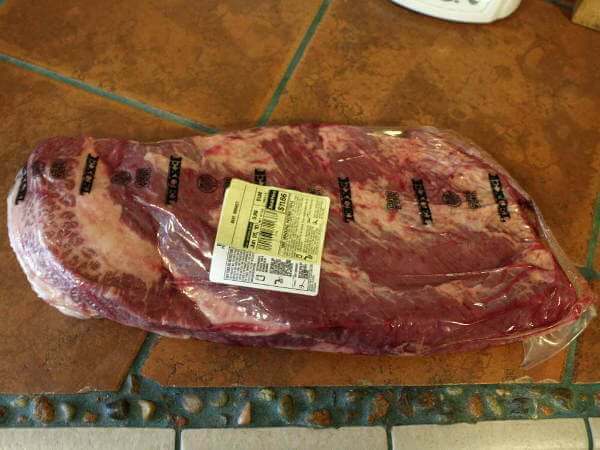 A whole beef brisket consists of the flat, the point and the fat cap. The flat section has fairly uniform grain direction, and is roughly rectangular in shape and even in thickness. The point is a more rounded and fattier cut. Some prefer the leanness of the brisket flat, but for me, I’ll take a big juicy hunk of the smoked point every time! The fat cap covers what was originally the outer layer of the brisket. It varies in thickness, and some of it is left on when preparing for the smoker - trimmed one-quarter to one-half inch thick is about right. The fat protects the meat from drying, and bastes the brisket as it melts. I usually score the fat cap in a cross hatched pattern before marinating and seasoning with the brisket rub. The cuts in the fat cap allow seasoning flavors to reach the meat, and also help the fat melt. 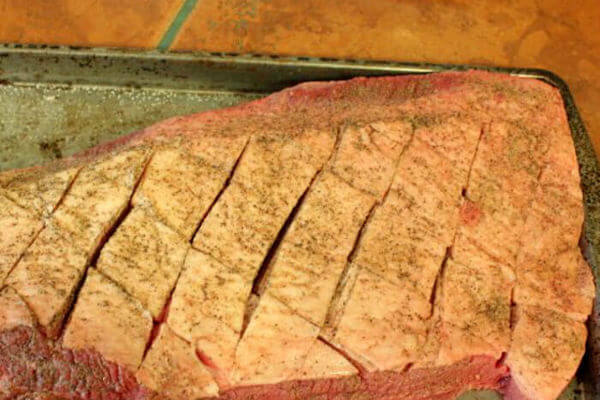 The cut-pattern looks great on the finished brisket, too. 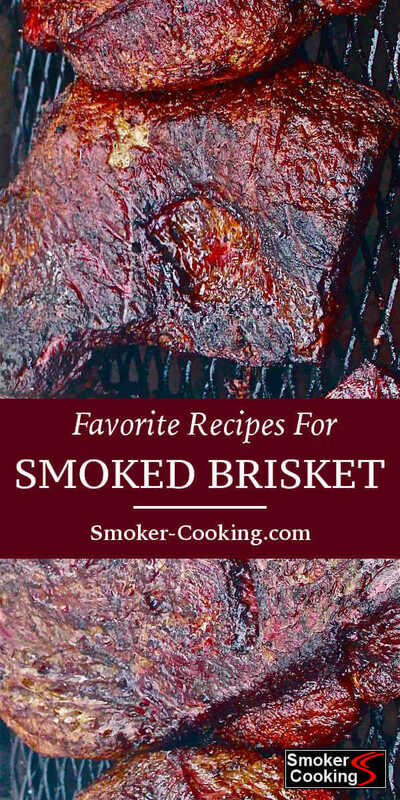 You’ll find that most of the smoked brisket recipes here are made using whole beef briskets, but with minor changes the recipes can be used for smoking trimmed brisket flats as well. Less marinade and dry rub is needed for the smaller flats, and they’ll need a little less time in the smoker. It’s uncommon to find brisket points sold separately, so if that’s what you want, just ask someone at the meat counter in your grocery store. I usually buy whole, packer cut briskets and smoke them whole, but occasionally I'll separate them into the flat and point sections before smoking. This takes a bit more prep time but decreases the smoking time. Also, the fattier point can take longer to cook than the flat so by separating them, each can be cooked until just right. After trimming the brisket to an even shape, then thinning and scoring the fat cap it's time for the flavors. Using only a brisket dry rub is perfectly fine, but some of the smoked brisket recipes call for marinating the brisket first. Marinating can be done for just a few hours up to a couple of days, depending on the depth of flavor desired, and the type of marinade used. Acidic marinades are best used for shorter periods of time. Before seasoning with the rub, use a towel to remove the marinade from the surface. Apply the rub, then wrap in plastic wrap. A couple of hours up to overnight in the refrigerator will provide the time needed for the flavors to permeate the meat. Once in the smoker, you'll be paying attention to the smoker temperature, the amount and timing of smoke applied and basting. Wrapping the brisket with foil after it's smoked for a few hours in optional, but can speed up the cooking time. Maintaining a steady smoker temperature is important. The best temperature range is 225-240˚ Fahrenheit. Cooking time for a whole brisket can be from 8 to 12 hours, and possibly longer, depending on the size of the brisket. 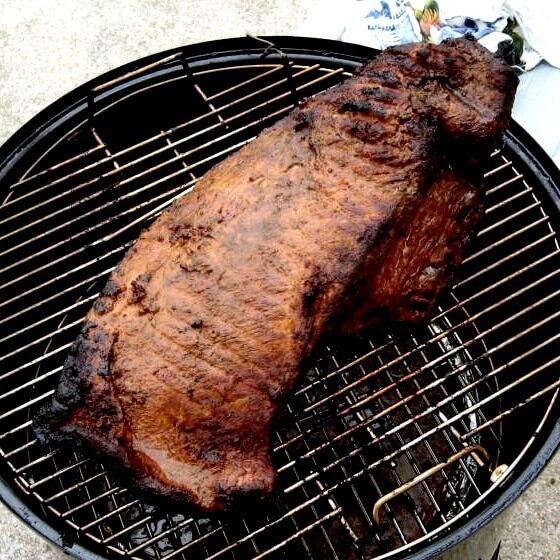 A brisket's final done temperature can be as low as 190˚, or as high as 200˚. Test the meat for tenderness with a knife or fork for your final determination. Basting with brisket mopping sauce adds flavor and helps the meat remain juicy. Some use a spray bottle to baste with, using combinations of apple juice, vinegar, wine or beer and vegetable oil with seasonings. If you decide to wrap it in foil, wait until at least a few hours have passed and a bark has formed on the surface. Wrapping it tightly in two or three foil layers will hold in the moisture, and in turn speed up the cooking time. When it's done, the brisket can be removed from the foil and cooked for another 30 minutes to an hour, which will help make the bark nice and chewy. When the brisket is done, a rest period improves the quality of the meat. Re-wrap it in foil and let it rest on the kitchen counter for at least a half-hour. Ideally, place the foil-wrapped brisket in a cooler (to trap the heat), and let it rest for 2 to 4 hours. For more detailed instructions check out my tutorial, How to Smoke a Brisket. A well cooked smoked brisket is a real treat, but when you add the flavor of bacon to the equation, you've got something special. This recipe makes a darn tasty sandwich. The cheese and smoked brisket go together like bacon and eggs. Included are a German lager marinade spiced with one habanero pepper, and a sweet-tart citrus marinade with lemon. Here you'll find a Basically Fantastic Brisket Rub, and a recipe for Tejas Style Rub. Both are quite tasty. 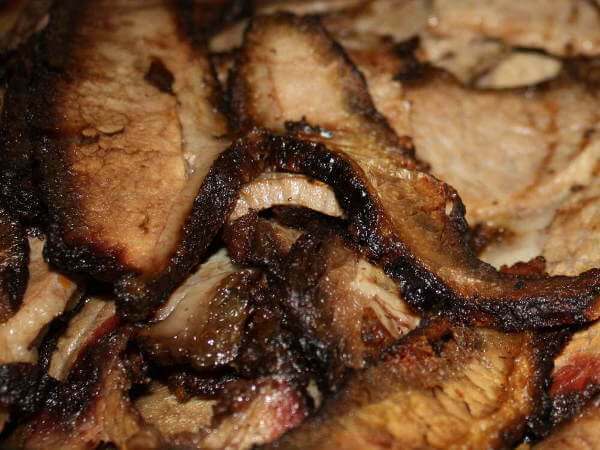 Peppered Bay and Garlic Brisket If you like the flavor of garlic and bay leaves, you'll really like this recipe. Cloves of garlic and leaves of sweet bay are inserted deeply into the meat, flavoring it from the inside out. Texas Smoked Brisket This spicy recipe takes a cue from the flavors of the Southwest...peppers, cumin and more give this one a flavor you won't forget. And don't forget to keep it moistened with the mopping sauce! Irish Brisket Marinade Enjoy your Guinness Extra Stout as an Irish marinade for your next brisket. Save a couple bottles of the stout to sip during mealtime! 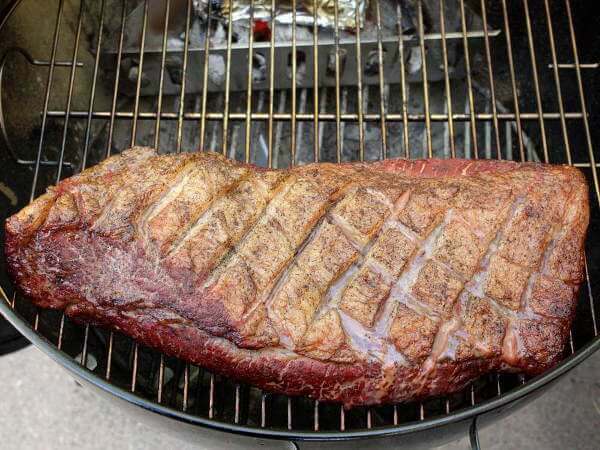 Beef Brisket Coffee Rub A dry rub adds lots of flavor to the brisket and is just about mandatory for creating the perfectly seasoned hunk o' beef! Spicy Brisket Rub If you like excitingly spicy flavors, give this brisket rub a try. You can always back off on the amounts of hot stuff if you prefer a tamer taste. Brisket Mopping Sauce Slather this liquid onto the brisket every half hour or so. You'll be adding flavor and moist goodness to the meat as the wisps of smoke gently lick its surface. Smoked low and slow, these brisket recipes create tasty, tender meat that you'll be proud to serve. A platter full of sliced brisket, a loaf of bread, some home made barbecue sauce, and a big bowl of smoky baked beans makes for a great weekend feast!